more beautiful homes to share and a fabulous giveaway! there was no way I would pay anywhere near that amount. a ton. I can barely lift it even when empty. headed to the nursery tomorrow so I’ll be back soon to show you the other urn. What a pretty urn and a pretty color too.Have a wonderful weekend. I kust wisit your blog and i follow! That is gorgeous, Sherry. Enjoy your break. Enjoy your blog break my dear friend..we all need to do that at some time..Hugs and smiles to you Sherry..
looks beautiful! Hope you paid MUCH less than the price. Love that urn filled with shells and other sea life. I love the combination of those items together. Hope you have a nice break. I know you must need it. Can't wait to see how the other one gets filled. Everything looks so beautiful. Such a lovely Blog. Thank you for sharing such beautiful things. 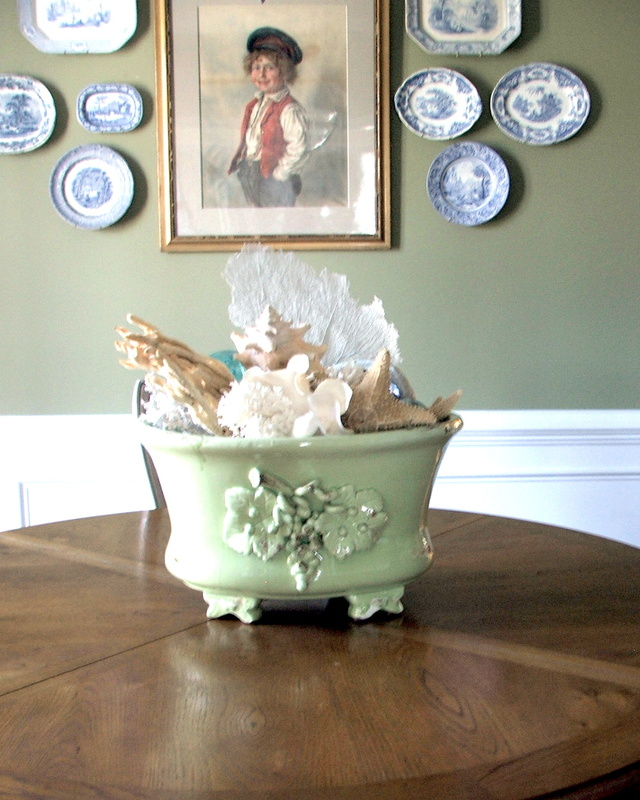 Oh I absolutely LOVE that urn – it is remarkable with shells on your table – perfect in every way. Hope you got a decent bargain – wow no wonder they went out of business, $400 price tag? YIKES! Can't wait to see what you do with the other one! The urn is beautiful! Great find! Wonderful urn! Enjoy your break! What a beautiful urn! Enjoy your break! What a wonderful find! Love the color and the size. Beautiful piece, Sherry! Enjoy your break! Beautiful urn Sherry…love that color!!! Take all the time you need, I for one will be here when you return. Sherry you got a treasure! The color is set off by the beautiful shells and things from the sea. Have a great spring break! I love the urn! It is very pretty and you could fill it with so many different things. Enjoy your break! LOVE your new urn and when you look at the print behind it you can see how big it really is!! enjoy your break!! And I'm SO jealous you can buy plants already! Here in upstate NY we can't yet 🙁 Usually not until May! Sherry That urn is gorgeous,It looks wonderful on your table.Thanks for sharing. Don't you just love a great bargain like that? What a beautiful piece and I like the shells with it…so perfect for the season. Have a wonderful Spring break and I'll link up when you return but I'll visit as you find time to keep us up to date. It's so pretty, so glad you were the high bidder! 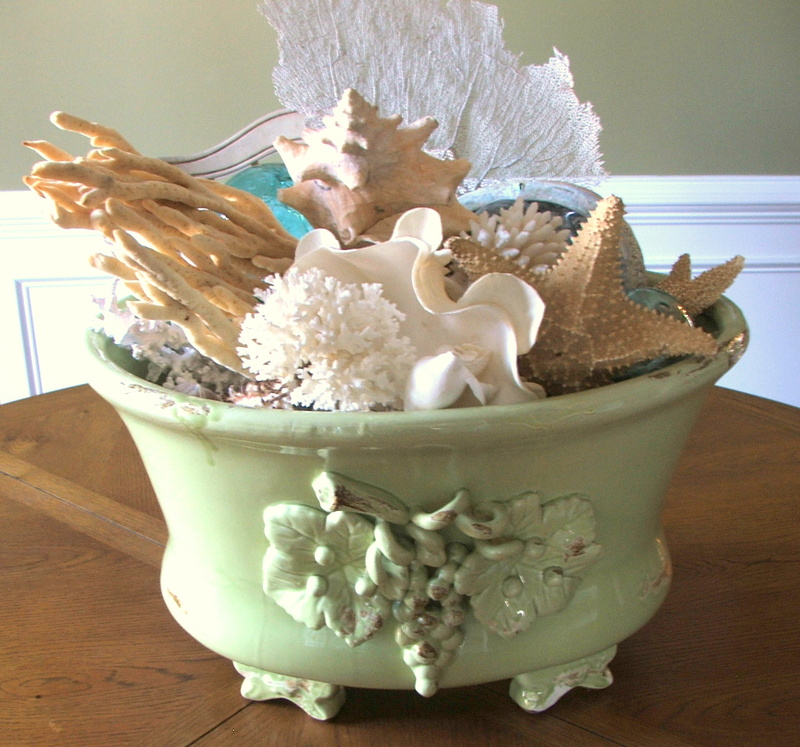 Sherry what great finds, I love these precious urns , the sea life is perfect! Take care and we will miss you. I do really like he urn, especially the color. Thanks for sharing and relax. Sherrie…thank you so much for leaving your comment over at 21 Rosemary Lane regarding my chalk paint post! You are one of my most favorite bloggers! I am also very honored that you took the time to stop by my blog. Your work is wonderful. You are one very well thought out DIYer…love you and am an avid follower. Love the urn and the color..one of my favorites! Absolutely lovely! I'm not afan of green, but this is gorgeous. I love the grapes. In my new post I have some bathroom beauties:)check it out.